If first impressions are everything, then MobileMe never had a chance. After I bought my iPhone 3G, I signed up for the trial MobileMe account. Back then, it was only a 60-day free trial, but Apple soon added 30 days onto that, and then 30 days onto that, after MobileMe’s launch arrived like a lead balloon. The idea seemed swell enough: sync your Address Book, iCal, and Mail settings and entries with the ever-present Cloud, and your iPhone. But since July, I’ve run into more problems than solutions, and MobileMe has been a frustrating mess. My free trial is up on Monday, Dec. 8. I’m going to cancel my account. 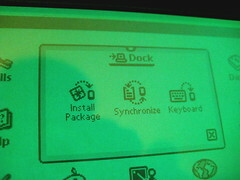 Looking back, I never really needed MobileMe to begin with. Because I plug my iPhone into my Mac almost every night, any new entries in either iCal or Address Book get synced each way – from the iPhone to my Mac, and from my Mac to my iPhone. I don’t need the “push” capabilities MobileMe claimed to offer because my syncing schedule was fast enough. It’s too bad. Apple had a big uphill effort replacing the .Mac service. MobileMe seemed like a decent-enough resolution to everyone’s complaints against .Mac: not much storage, lackluster syncing, no star features that made it seem worth the $99 annual subscription. With it’s modern browser interface and over-the-air syncing, MobileMe looked great on paper. In practice, however, it failed to live up to my expectations. Maybe it was a lack of habit, but I never found myself missing MobileMe when I wasn’t using it (which was often). If I used my iPhone and Mac for business, the cloud syncing might seem like a bigger deal. But I had a system down, and it worked just fine for me. The one feature that did catch my eye was the photo sharing galleries. My friend’s wedding photographer put together a beautiful presentation (the subjects helped) using MobileMe’s slideshow capabilities. But again: I don’t really need it. Flickr works just fine as a photo-sharing environment for me. I can make slideshows with Flickr that look fine for my needs. I’m not a wedding photographer. I don’t need anything fancy. Another thing that bothered me? The fact that iDisk iDisk Sync [thanks commenters!] takes up the 10 GB of space from my hard drive. Maybe I’m a rare case, but when I launch iDisk, it takes away whatever space is available away from my Mac’s “available” space. Why store things on a fragile cloud when my hard drive works just fine? I love the idea behind iDisk, but my iBook is cramped enough without taking that additional 10 GB away. Apple’s solution? Don’t use iDisk Sync. The launch didn’t help things. We all remember that, right? The big outage that first weekend. How it took weeks and weeks of Apple tinkering to get even basic services like e-mail up and running for all MobileMe users. 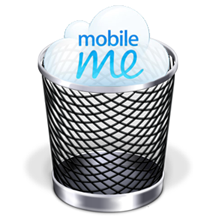 For a while there, MobileMe seemed like a big embarrassing misshap for Apple – right up there with the big system outage for the iPhone 3G’s launch. That kind of thing can leave a bad taste in the mouth. I guess it’s never gone away for me. Part of me is skeptical about this “cloud computing” stuff. I understand that Google seems to have it down, barring Gmail outages, and – lord bless them – Microsoft is working on their own cloud syncing projects. But Google apps like Gmail are hooked up to my Mail.app, which runs from my desktop, and I don’t often make appointments or add contacts through a web browser. That stuff lives on my Mac. I like that I can edit a contact’s information on my iPhone and the change gets logged in Address Book in OS X. There’s no extra log-in-to-the-web-service involved. If I had several Macs strung out over several locations, with only my iPhone in common, the idea behind MobileMe could come in handy. Backing up my data to the cloud? Sure. Do it all the time. But easy and reliable syncage still seems to be a giant Work In Progress. I’m not yet impressed. So thanks for the couple of free months, Apple, but I’m saying “no thanks” to MobileMe. Maybe some day I’ll find a use for it – one where I can justify renewing my subscription. Right now, though, I can’t see any good reason to keep MobileMe around. It’s either been a thorn in my side or a non-starter, and life’s too short for either of those. Posted by davelawrence8 at 5:57 am on December 4th, 2008. 10 comments... » Categories: apple, ipod/iphone, software. 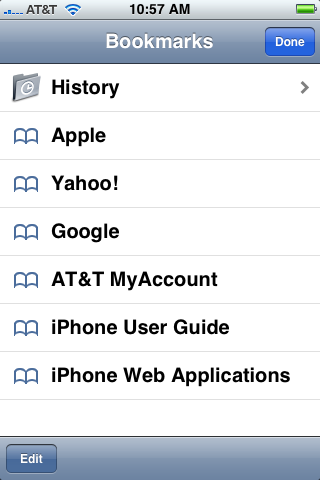 Tags: address book, apple, cloud, fail, ical, idisk, iphone, iphone 3g, launch, mobileme, subscription, sync. Subscribe via RSS. As I hinted at Friday, I had success connecting my Newton eMate 300 with my iBook G4, running OS X 10.4, using a Keyspan serial-to-USB dongle I recently grabbed off eBay. This has been a long time coming. I first wrote about how to connect your Newton with OS X back in March, and there are tons of resources a Google search away, but here – for the first time – I got to see first-hand how the whole process works. And it’s such a snap. Posted by davelawrence8 at 5:27 am on December 1st, 2008. 11 comments... » Categories: DIY, howto, ibook, newton. 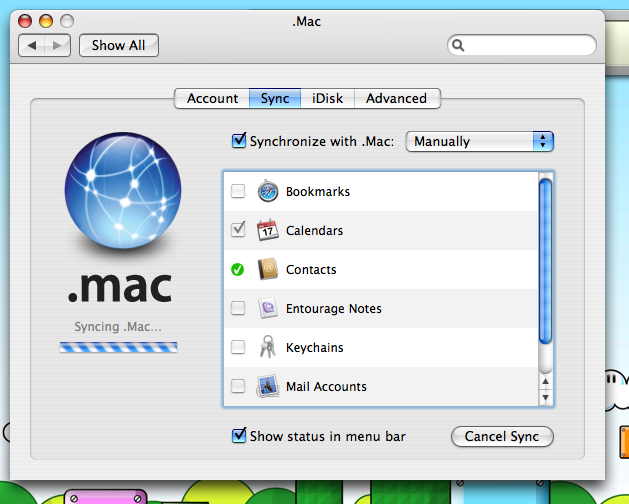 Tags: address book, connect, connection, dates, eMate, escale, ibook, ical, keyspan, messagepad, newton, serial, sync, synchronize, USB. Subscribe via RSS. Mobile OS X: are the pinstripes back? In the G3-G4 Mac era, pinstripes were everywhere. 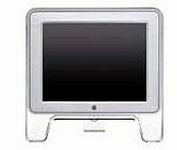 Look at the front of a G3 iMac, or an Apple Studio Display (CRT or flat screen), or even OS X up until Panther. 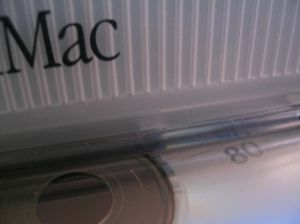 Even the classic Mac OS had pinstripes on the tops of windows, and the pre-Power PC Macs had pinstripes as a rule. Takes you back, doesn’t it? With its darker hue and thicker lines, the Mobilie OS X goes for a more professional and buttoned-up look, much like OS X 10.5 Leopard, than the lighter, “lickable” OS X of yesteryear. The pinstripe motif is mostly a simple backdrop to app screens displaying boxed areas of information (iCal, Settings). But also, the vertical stripes lend to the iPhone’s mostly vertical orientation. Granted, the pinstripes only appear here and there (I noticed the scheme in a few apps, like UrbanSpoon, too) – instead of everywhere with OS X 10.0 and beyond. The more unified look of Leopard begins to break down in areas like this, much as Panther and Tiger only used the brushed metal design willy-nilly. I agree with John Siracusa: using OS X 10.2 Jaguar on my iBook G3 is a “jarring” experience: the clunky finder, the toy-ish polish on buttons and tabs, and all those pinstripes. Now they’re back, in iPhone form. Posted by davelawrence8 at 6:48 am on July 31st, 2008. 2 comments... » Categories: ipod/iphone, OS X. Tags: apple, design, ical, imac, iphone, jaguar, leopard, mac, OS X, pinstripes, studio display. Subscribe via RSS. To test my MobileMe account’s syncing ability, after getting it up and running yesterday, I ran a simple experiment: schedule a reminder on the iPhone calendar (above, for a Chicago trip this weekend), and watch what happens. The above screen shot is from iCal, one whole day later. 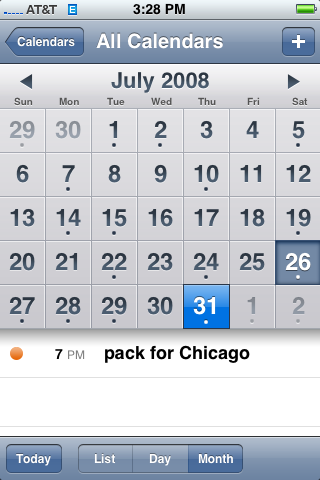 Notice no event scheduled to remind me to “pack for Chicago.” Nope, just a few reminders that were already there. Despite telling MobileMe and the iPhone to sync every hour, MobileMe sent nothing to iCal. 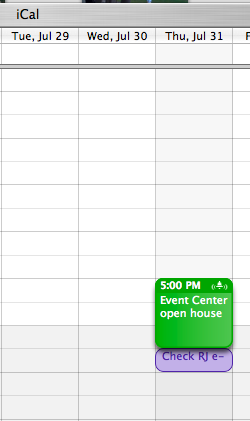 And that iCal reminder, the green one about the open house? That didn’t get pushed to the iPhone, either. Things really started to get weird when I received a phone call. Instead of my contact’s name popping up, the iPhone displayed the number only. It turns out that 90% of my contacts were missing from my Contacts app. Where did they go? So even though I told MobileMe to sync my contacts, my iCal events, and my Safari bookmarks, none of that made it to my iPhone. MobileMe, on my iBook G4 running the latest Tiger install and synced with an iPhone 3G, doesn’t work as advertised. The web version is only a little better. That “pack for Chicago” reminder? It showed up in MobileMe’s web iCal. 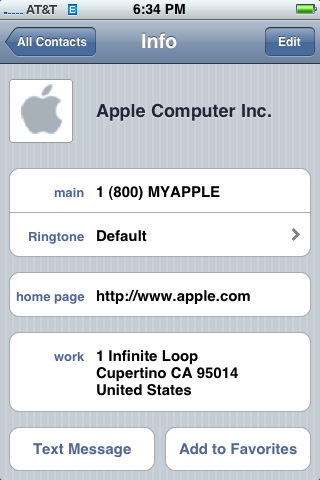 But my contacts made it from either my iPhone or my iBook just fine – but why wouldn’t they show up on my iPhone? Surely these are all symptoms others have reported before – but MobileMe actually syncing with Tiger was enough of a treat to try the whole thing out. It turns out, though, that MobileMe probably isn’t for me. Not the way it’s working now, at least. Posted by davelawrence8 at 5:27 pm on July 27th, 2008. 7 comments... » Categories: ipod/iphone, software. Tags: 10.4, 3G, apple, bookmarks, contacts, ical, iphone, mac, mobileme, OS X, sync, syncing, tiger. Subscribe via RSS. You see that? Finally, after two weeks of waiting, my MobileMe account syncs to that damn cloud that keeps raining on everyone. Every day since I purchased my iPhone and signed up for the free 90-day trial of MobileMe I’ve tried syncing my iBook (running OS X 10.4.11), and every day it gives me the same message: try again, buddy. But, like a mouse hoping the electrified button will bring more cheese, I kept trying. Finally, this morning, after a friend had sent me an e-mail asking if I liked MobileMe (and right before I sent my reply saying “don’t even think about it”) the .Mac sync screen above showed up. It parsed through my iCal and Address Book settings and sent them to MobileMe Land, which meant I could keep everything on my iBook and iPhone synced. Good news. Things have gotten so bad that usually-secretive Apple has a MobileMe status blog of sorts from some mysterious employee who received a directive from Steve Jobs: inform the masses. Apologize. Send it via RSS. Keep them In The Know. In the 14 days since we launched, it’s been a rocky road and we know the pain some people have been suffering. Be assured people here are working 24-7 to improve matters, and we’re going to favor getting you new info hot off the presses even if we have to post corrections or further updates later. 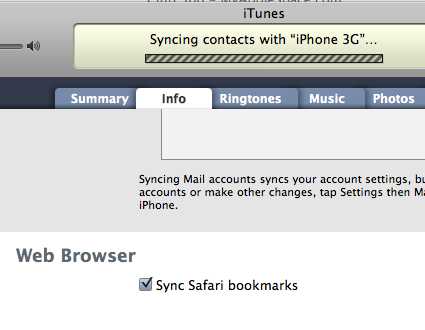 The true test comes in about an hour, when my MobileMe account is scheduled to sync. I added a Calendar (is it iCal on the phone? I get confused…) event on the iPhone, and we’ll see if it shows up in iCal on my Mac sometime in the near future. But even that little note above, where the .Mac preference pane shows the damned thing doing something, is enough to give me hope. Any other MobileMe syncing successes out there? Let me know in the comments. Posted by davelawrence8 at 2:28 pm on July 26th, 2008. No comments... » Categories: ipod/iphone. Tags: address book, apple, contacts, ical, iphone, mac, mobileme, push, sync. Subscribe via RSS. 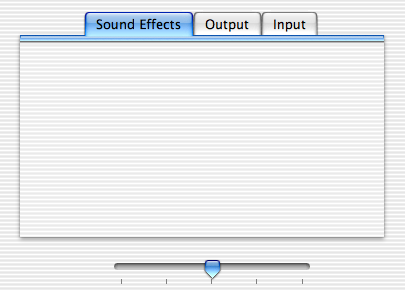 It’s typical of an Apple product to delight and amaze the more you use it. The iPhone 3G is no different. It’s been a ton of fun to use and explore in the week I’ve had it. 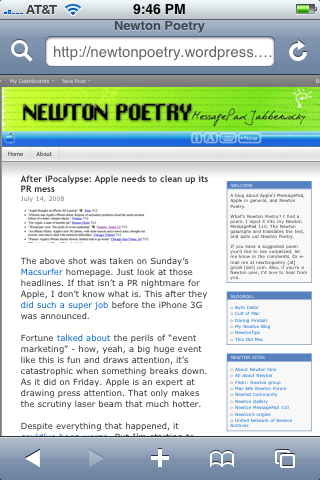 First, I discovered this blog looks good on the iPhone’s screen, both in vertical (above) and landscape mode. Other blogs out there are helping me discover new things. First, in Mobile Safari, just hold down the .com button for a second to see other domain options (namely .net, .edu, and .org). 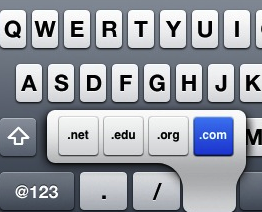 Second, when the keyboard has the @ symbol but no .com key, you can hold the ‘.’ (period) key to get the same domain shortcuts – something that comes in especially handy when you’re manually entering email addresses or filling in login credentials in new apps. Just the “.com” in Safari was enough to make me smile. But this? That’s handy. 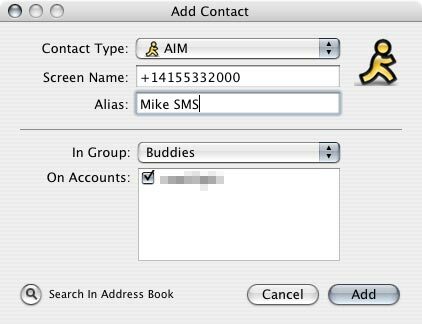 Wired’s How-To Wiki taught me how to avoid SMS charges (I opted for no text plan): plug your contact into AOL’s free iPhone AIM client and text to your heart’s content for free. I’ve tested it, and it works great. To Do apps, however, were another story. I struggled with the multitude of options out there: free apps, pay apps, voice note apps. I hate to sound cheap, but I was mostly looking at free solutions, and the reviews were of little help because they went either way. Finally, a new app popped up in the App Store – Dobot’s To Do app – so I downloaded it on a whim. And so far, it suits my needs pretty well. I was never a big fan of the Newton’s solution to to-do lists. 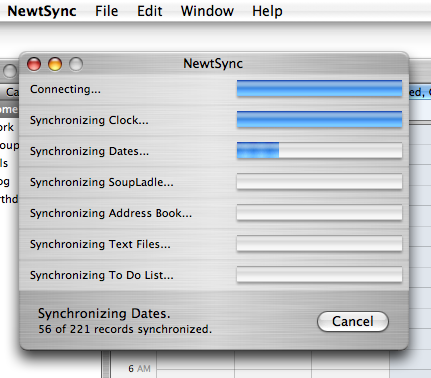 The easiest way was to sync the Newton with Newton Connection Kit and type up the list on my iMac. The keyboard made the whole process more comfortable and quicker. But on the road, you have to scribble a note, highlight it, have Assist interpret it, and the it appears in your to-do list. Way too complicated, and awkward when all you want to do is have a list of check-off items. 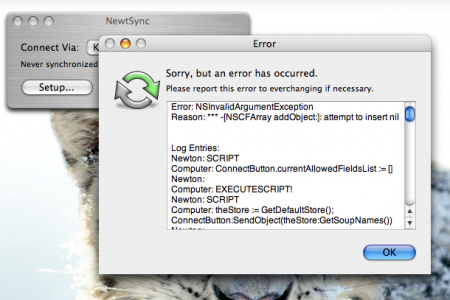 In fact, it’s one of the key gripes that I have against the Newton. 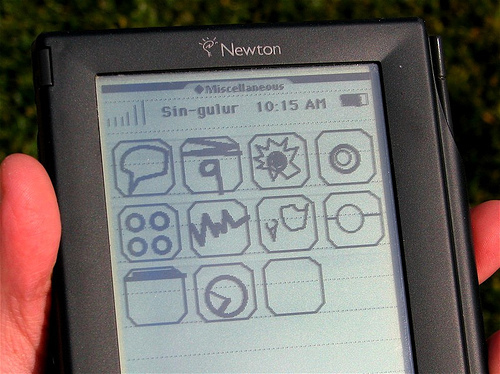 I’m sure there’s another to-do app out there, but I’m limited with my Newton OS 1.0. If Dobot’s To Do app fails me, I can always spring for app that costs actual money. What I’m hoping, however, is that somehow Apple includes some sort of iCal to-do list sync. My experiment is to try and use only the iPhone for lists, to-dos, and calendars for the next few weeks. By forcing myself to one platform, I can get to know its ins and outs, and find out what it lacks. Posted by davelawrence8 at 8:16 am on July 17th, 2008. 3 comments... » Categories: ipod/iphone. Tags: .com, 3G, AIM, AOL, app store, apple, domain, ical, iphone, newton, poetry, sms, sync, text. Subscribe via RSS.